Who is Killing Honduran Journalists? People protest against violence in Tegucigalpa, Monday, May 3, 2010. 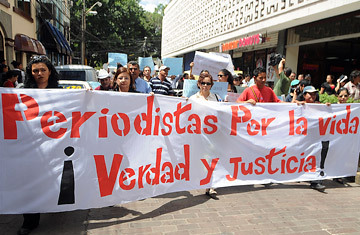 The banner reads in Spanish "Journalists for life, truth and justice." The killers were waiting for Lucas Manzanares as his Mazda pickup rolled through downtown Tegucigalpa the morning of May 8. With him were his wife, daughter and 6-year-old granddaughter; but as he slowed down in traffic, the two gunmen stepped up anyway and fired more than 20 rounds from their 9-mm automatic pistols into the pickup cab. Manzanares and his wife, remarkably, survived. His daughter and granddaughter were killed. Hondurans might have dismissed the killings as just one more cold-blooded atrocity in the nation with the Western hemisphere's highest homicide rate. But Manzanares is a close aide to the publisher of one of Honduras' leading newspapers  making him the eighth journalism-related target attacked in almost as many weeks in that country. Since March 1, seven journalists have been murdered in much the same execution style that Manzanares' attackers attempted. Many fear their deaths may signal a new, more violent chapter in the Honduran political crisis, which began after last summer's military coup and has since caused the U.S. a raft of diplomatic headaches in Latin America. "We can't reach sure conclusions yet about these cases," says Honduran newspaper columnist Alfredo Haces. "But a lot of journalists here are living in terror." So much so that some have begun wearing bullet-proof vests on the job. U.N. human rights experts this week called on Honduran President Porfirio Lobo to "thoroughly investigate these killings" and "ensure the physical and psychological integrity" of journalists. The U.S. has also expressed "grave concern". But the Lobo Administration, elected last fall while a coup-installed government was in power, is downplaying any suggestion that freedom of expression is under threat, even though most of the slain journalists covered sensitive beats such as politics and drugs. "In no case is there a sign of any organized group wanting to silence journalists," Public Security Minister Oscar Alvarez insisted this month. Press freedom watchdogs say it's absurd to discard that possibility so quickly, especially since no arrests have been made in any of the cases. "It's really irresponsible," says Carlos Lauria, senior Americas coordinator for the Committee to Protect Journalists in New York, "when you consider the chilling effect these killings have had on the media in Honduras." Alvarez's statement seems particularly hasty given the backdrop of the murders  the violent civil tensions that have afflicted Honduras since last June's ouster of leftist President Manuel Zelaya, which led to a heavy-handed crackdown on the media by his de facto successor, Roberto Micheletti. Micheletti stepped down after Lobo's January inauguration, but bad blood has lingered between Honduras' polarized pro-coup and anti-coup factions. One of the journalist victims, radio reporter Nahum Palacios, had received death threats from the military last year after broadcasting reports critical of the coup. On the night of March 14, as Palacios drove home in the city of Tocoa near the Atlantic coast, a car carrying gunmen pulled alongside his and shot him several times, killing him. Two weeks before, television journalist Karol Cabrera, an outspoken supporter of the coup, was attacked by hitmen on motorcycles in Tegucigalpa. She survived multiple gunshots, but a journalist friend who was with her, Joseph Hernandez, was killed. In December, gunmen killed Cabrera's teen-aged daughter. But in Honduras today, politics may not be the only source of a possible motive for killing people involved in the media. Drug trafficking violence is rampant; and, as in narco-paralyzed countries like Mexico, journalists who report on the plague are targets. Before his killers sprayed his car with bullets in La Ceiba on March 11, radio reporter David Meza had received calls warning him to "be careful" with his drug coverage. Journalists who cover Honduras' bitter land disputes, as Palacios did, are also at risk. "There exists a degree of violence never before seen in this country," says Leo Valladares, an attorney and former federal Human Rights Commissioner, whose own son was killed last year by one of Tegucigalpa's notorious carjacking gangs. "The country's institutionality has been utterly weakened." Just as unprecedented is the degree of impunity, says Vicki Gass, senior associate at the Washington Office on Latin America. Under Honduras' dysfunctional judicial system, only a tiny fraction of its thousands of homicides each year are ever solved. Gass adds that if military figures were involved in the killing of journalists like Palacios, "they may well have been feeling emboldened" by the fact that the army effectively got away with last year's coup. The U.S., which at first condemned the putsch, eventually decided to recognize the results of last November's presidential election to help Honduras move on. That's why Lobo's response to the journalist murders  or lack of one  matters in Washington as well as Tegucigalpa. If he and his ministers, without credible investigation, simply dismiss the possibility that the killings are a form of media intimidation, it could cast doubts not just on their commitment to healing Honduras' divide, but on the Obama Administration's decision to back them. Press advocates are hoping that this week's establishment of an independent, Lobo-backed Truth & Reconciliation Commission to examine the coup will move the government to take the journalist homicides more seriously. Meanwhile, two more journalists have reported receiving death threats. With all due respect to Minister Alvarez, it's not so outlandish to imagine someone wants to silence them. See the TIME 100 list of the world's most influential people. See the pictures of the week.